Project scope: Who would you be and how would you act if you were totally unmasked, revealing the one who has always been present since fracturing from Source…the one who knows all things and knows why they're here on the planet at this time. Wanda Vitale leads clients to the most authentic parts of themselves in order to start expressing their unique soul mission. This is not a mental endeavor, rather it is done from true energetic resonance. Every experience becomes an opportunity for clarity and expansion. As we shift so does the world. If you are reading this now, you are one of the pioneers being called to step fully into your power and specialization as the world undergoes a huge transition. 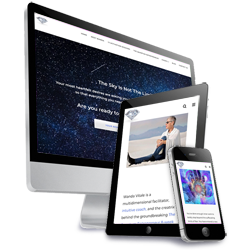 Design Components: Design of existing site including all new graphics, site layout mirroring an existing WordPress theme. The site also includes a WordPress blog. Design Components: New site design consisting of all graphics including the menu, image design and site layout. “ David makes it very easy for me to be the creative business owner I am while he takes care of the details. His insight and recommendations made my website look very polished and visually appealing. People respond to not only what we say, but to how things look and that is one of David’s gifts. And he works tirelessly under tight timeframes to deliver!